Private 50140 11th Bn. Essex Regt. 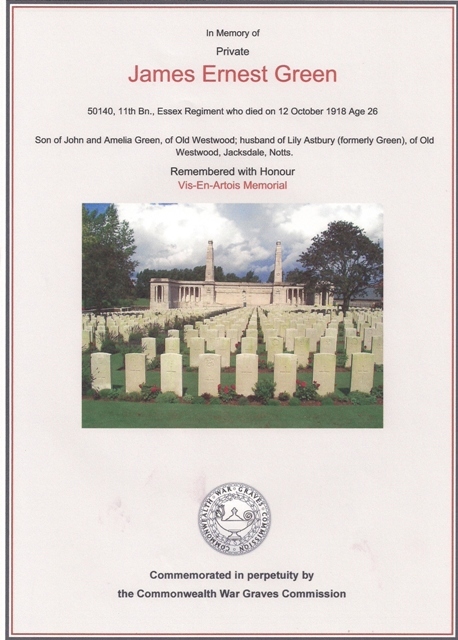 Listed on the Jacksdale War Memorial as ‘E’ Green, James Ernest Green was born in 1892 at Old Westwood (Palmerston Street), Notts, the son of John & Amelia Green. Amelia Green lived to the great age of 96. 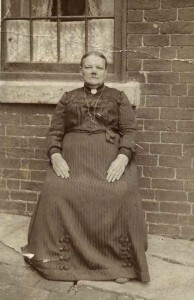 She was born in 1851 and moved to Fletcher’s Row, Ironville, Derbyshire in the 1870’s when her husband, John, obtained employment at James Oakes and Co. Pollington Pit, New Brinsley, Notts. Before James was born they had moved to Old Westwood (Palmerston Street), Notts, much closer to Pollington Pit. John died on the 6th May 1924 aged 71. Amelia died on 24th October 1947. Both are buried in St Mary’s Churchyard. They left 7 children, 32 grandchildren and 41 great-grandchildren. James Ernest Green had 4 brothers: John b. 1878, Thomas b. 1879, George b. 1881 and David b.1888 He also had 5 sisters: Emma (m. Berrisford), Margaret, Lucy, Phoebe Anne (Annie) b. 1894 (m. Clarence Henry Castledine) and Florence b. 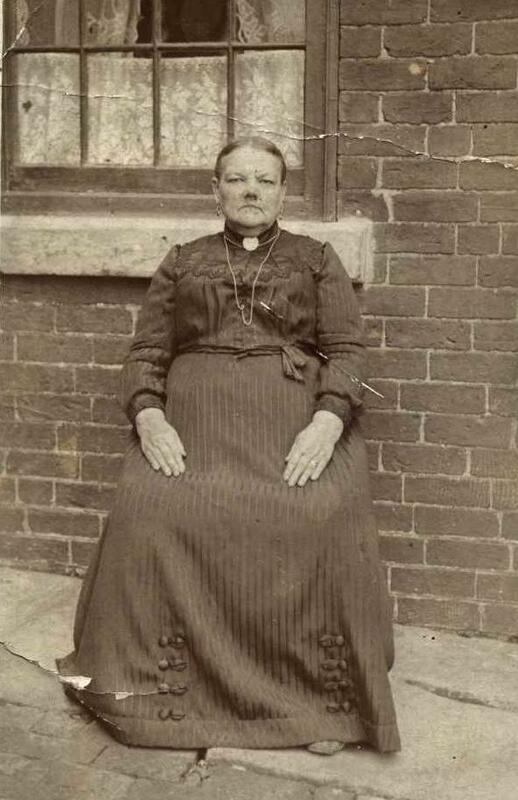 1890 (m. Watchorn). Charles William (Willie) Green, Pte 131089, 86th Bn. Training Reserve (listed on the Jacksdale War Memorial as having served) was probably his Nephew. James Ernest Green was killed in action on 12th October 1918, aged 26 years. Coincidentally, his friend Lance-Corporal Joseph Naylor (64962 North Staffs), also of Palmerston Street, was wounded on the same day (listed on the Jacksdale War Memorial as having served) and recounts the death of his friend in his memoirs called ‘From Pit Lad To Deputy’*. James left a widow Lily Green who, after the war, was to marry Thomas Astbury of Sedgwick Street (listed on the Jacksdale War Memorial as having served). 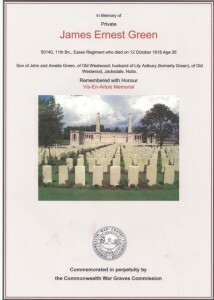 James Ernest Green is commemorated on the Vis-en-Artois Memorial, Pas de Calais, France. George Wilmott (K-in-A, 18th Sept. 1918) Pte. 116557, 10/4 Bn. Sherwood Foresters is also commemorated there. This Memorial bears the names of 9,000 men killed in the period from 8th August 1918 to the date of the Armistice who have no known grave. * ‘From Pit Lad To Deputy’ is an extract from ‘Selston Victorians’ published by the W.E.A. Essex Regiment WW1 casualties 8,209 (Source www.essexregiment.co.uk ).